Hydrogen and lithium, along with silicon, are arguably two of the most important elements in advanced energy material technology. As a result, understanding the character of these elements in a variety of environments over a broad range of conditions is crucial for addressing many energy challenges. Many low-Z materials are now known to exhibit a broad range of new phenomena, including many that are ultimately important for energy applications, such as superconductivity and insulator-metal transitions. Despite a century of study, many aspects of the bonding in the ‘simplest’ solids, hydrogen and lithium, remain unclear. One goal of new theoretical work within the Novel Electron Transport in Light Element Materials project in EFree has been to explore the differences and parallels in the behaviors of compressed hydrogen and lithium. By understanding the fundamental chemistry and physics of these "simplest" elements, it becomes possible to understand the structure-property relationships in more complex materials. 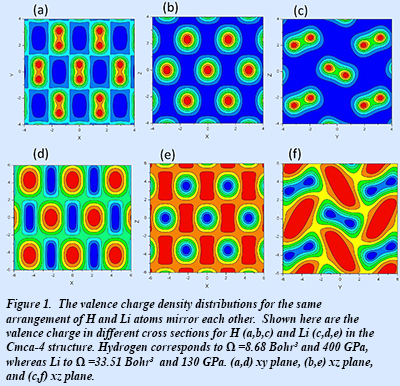 New ab initio electronic structure calculations show that the valence charge density distributions for the two elements in the same crystal structure mirror each other: the maxima (minima) in hydrogen correspond directly to the minima (maxima) in lithium (Fig. 1). This phenomenon is explained by the fact that H and Li are at different stages of pressure-induced s-p electronic transitions. For hydrogen, the transition has not progressed as far toward completion as for lithium at the specified atomic separation. Another important difference between the two elements that appears in the calculations is the jump in the kinetic energy across the pressure-induced first-order phase transitions. In hydrogen the kinetic energy decreases whereas in lithium the kinetic energy increases as a result of a phase transition. Remarkably, despite the many differences, hydrogen and lithium share a common tendency to adopt low-coordinated planar graphene-like structures at high pressure. The results have important implications for very high-temperature superconductivity in this class of materials [I. Naumov et al., J. Chem. Phys. 143, 064702 (2015)].